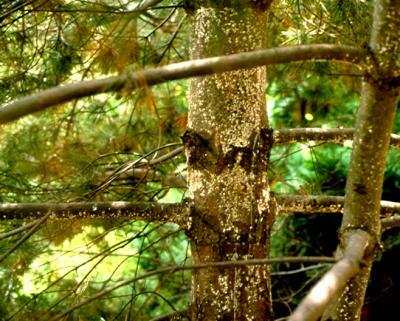 Of all the pines in the Midwest, eastern white pine seems to be the one most often attacked. Light infestations do not do much to the tree. However persistent, severely heavy yearly attacks can cause twig death, some stunting, and possible death of the trees. The adelgids produce a wax while feeding. The wax is a protective cover that resembles wool, making them look like wooly aphids to which they are related. Under this waxy wool, the adelgid is teardrop shaped and black in color. After overwintering on the tree, reproduction occurs in the spring. At least five generations are produced per year. Winged adults can be produced which fly to spruce for additional reproduction; however, this does not appear to occur in the Midwest. Insecticides can be used to control these insects. Apply in May or later when adelgids are present. In the spring, applya spreader sticker with theinsecticide.